Hi Itch to Stitch Readers! Last week we talked about how to sew bias bound seams in just three easy steps. This week, I’d like to show you another seam finish you’re going to love using in your garments: French Seams. French Seams work by “trapping” the raw edges of your seam in another seam. This was the very first seam finished I learnt how to do, so I promise it’s easy enough that even a beginner could tackle this technique. But first, why is it so important to finish your seams? After you sew a normal seam, there will be some raw fabric edges left exposed. These raw edges not only look a little unprofessional, they can seriously impact the durability of your garment by fraying and causing holes in your seams. If you’re going to spend the time to carefully make your clothing, you want them to last, don’t you? This is why finishing your seam allowances is so incredibly important in creating a long-lasting and professional-quality handmade wardrobe. It only takes a few extra steps, but will make a BIG difference in your sewing projects. One of my favourite ways to finish my seams is by using french seams. They’re great for lightweight fabrics like chiffon or organza because they’re lightweight while still being extremely effective. 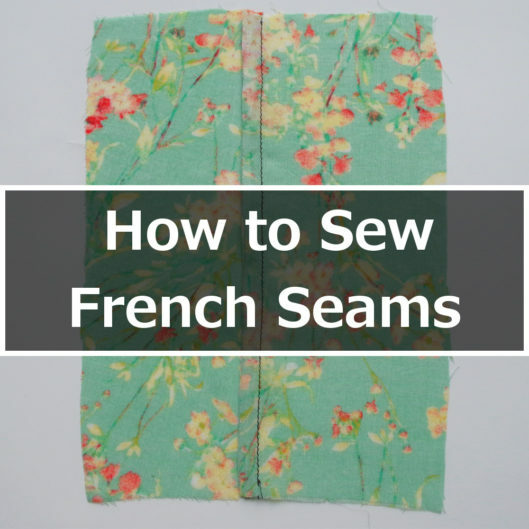 Here’s how you can add a french seam to your next garment. To make a proper french seam, you’ll want to be using a seam allowance of at least 5/8” or 1.6 cm, which is a standard seam allowance on many paper patterns for woven. If your pattern doesn’t have that much seam allowance, simply re-trace your pattern piece and add a little more before cutting out the fabric. This tutorial will show you how to make french seams on a seam allowance of 5/8” (1.6 cm), but this technique could be applied to larger seam allowances if you’d prefer. This is counterintuitive, because usually when sewing we keep our right sides together, but with french seams, we do the opposite. So, sew your seam with the good side of your fabric facing you. Trimming your seam allowance will allow us to “trap” these raw edges in another seam later on. You’ll want to make sure you’re cutting carefully here, cutting close to the seam line without accidentally cutting through it. Step 4: Press to the side. Press this tiny seam allowance to the side in preparation for step 5. The sharper the press, the better. Sewing this seam will capture all the raw edges from the seam sewn in step 2, giving you a perfectly finished seam on your garment. All that’s left to do now is give your garment a press and admire how pretty your seam looks on the inside and out! I think this versatile seam finish will come in handy in some of your future sewing projects, I know it’s definitely one of my favourite ways to deal with raw edges. How do you like to finish your seams? Let us know if there’s any technique you’ve been wanting to try down below and we can showcase it in a tutorial! About the Author: Hi! I’m Rachel, a fashion-obsessed maker from Canada. My goal here is to inspire you to sew creatively and try new things. You can usually find me drinking cold coffee while hanging out with my cat, or blogging my creations on Maker Style. HELLO, FROM TENNESSEE USA!! Kennis, I love your Itch To Stitch site!! All I can see at The Wild Stitch is a series of advertisements. I’d like to read the blog but don’t know how to get to it. Thank you! I saw a different tutorial on Ranch seams awhile ago, but it didn’t say what size seam allowance to start with. So the first time I tried to use it on a shirt, it didn’t fit. This is very helpful and I look forward to using it on my Bonn! Any special tips or tricks to making french seams on curved seams, like an arm scythe?